Architect and man about town Kevin Greenberg sends along this dispatch from Kenmare Street. 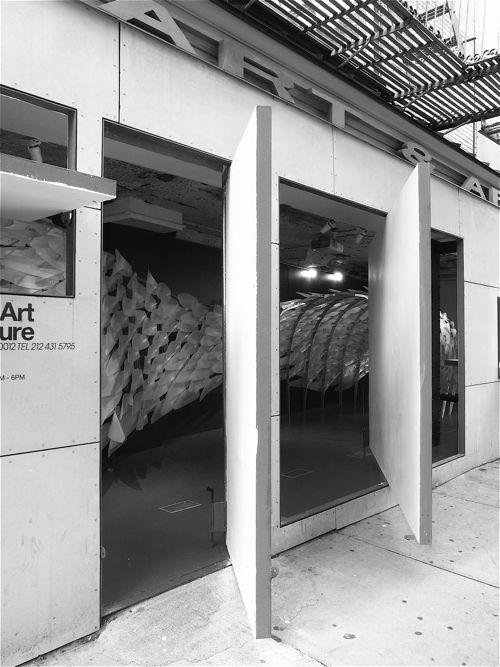 Reef, a new kinetic installation at the Storefront for Art and Architecture, exists at the intersection of “the super-exclusive and the trite,” according to its creators, Rob Ley and Joshua Stein. Composed primarily of densely-packed rows of lightweight fins anchored by Shape Memory Alloys (SMAs) across a metal armature, Reef simulates the unmistakable movement of muscle on bone, eschewing the jerky mechanical inelegance of a previous age in favor of bio-mimesis and the “semi-conscious willfulness” of a school of startled guppies or a field of flowers in thrall to the sun. The materials that afford Reef its movement profile (each fin commands a 160-degree range of motion) have previously been applied to both military technology and cheap toys—Stein and Ley initially were inspired by a $10 plastic butterfly—imbuing the system with a pleasant friction between the high and low. Reef's fins, made from shape memory alloys, can swivel up to 160 degrees. Reef’s ambiguity extends beyond its material composition. By design, Reef occupies a grey area between sculpture and structure, and its subtle, fluid movements evoke a basic form of life. Stein and Ley hope that those who encounter Reef will be forced to engage it in an unfamiliar way—to, in their words, “befriend” the softly undulating fins, or to be repelled by them. For its creators, Reef represents a new model for architecture: sidestepping usefulness, it is a study for environment as companion, or at least co-presence. Stein and Ley envision users eventually experiencing a biokinetic environment like Reef in the same way one might approach an encounter with a domestic robot or other form of semi-sentient intelligence. The bio-mimetic installation contrasts nicely with Storefront’s precise angles. It’s also capricious. “We were very conscious that we were treading in a territory that’s the realm of novelty toys,” Stein says. At a glance, it’s clear that Reef’s moving parts are not in any sense functional. Although the architects concede that the technology that animates Reef could be tailored to a more practical application (they’ve been approached to conduct façade studies and climate control modeling), for Ley and Stein such concerns are beside the point. Reef is an attempt to create a new kind of relationship between structure and end user. Reef, luminous among the throng. 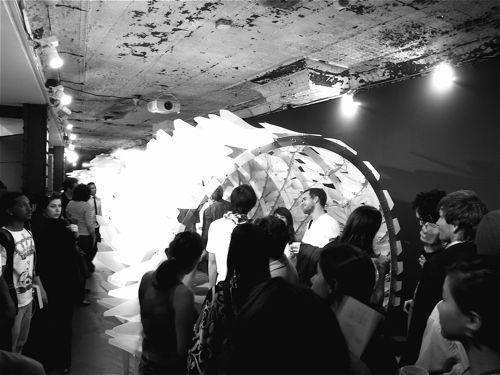 For Stein and Ley, who both have training in the visual arts as well as architecture, Storefront was the perfect setting for Reef. From the street, Reef’s long, sinuous profile, with its rows of translucent plastic fins, contrasts beautifully with the hard angles of Storefront’s signature swiveling apertures. Lit from above, the installation takes on the luminous quality of an alien form nestled in the ocean’s silent depths. On Tuesday night, as curious visitors filled the space and (as is often the case at Storefront events) spilled out into the humid evening air, Reef’s fins billowed coolly beneath the lights, seductively evoking a quality of animal potential. Reef will be on display through August 1. And next Thursday, June 4th, Ley and Stein will make an appearance at Storefront to discuss Reef and their collaborative practice. Rob Ley and Joshua Stein catch up during Tuesday's event. The “semi-conscious” form creates an inviting (or repellant) backdrop. The lovely Isaura de Farias Costa. Carrie McKnelly, Niraya Mendez-Gordils, and Alan Tansey. It curves this way! No, this way! SANAA alum and SO-IL partner Florian Idenburg. As usual, Storefront was mobbed with debauched architects.